Heidi F. Purtzer practices general civil law with an emphasis on business and real estate litigation. Prior to joining Wilenchik & Bartness, Ms. Purtzer practiced in Estate Planning, Elder Law, and Probate. While in law school, she held clerkships for the United States Attorney’s Office and Pierstone Law Firm. Additionally, Ms. Purtzer was an extern for Honorable James F. Metcalf in the United States District Court, District of Arizona. Ms. Purtzer received her J.D. 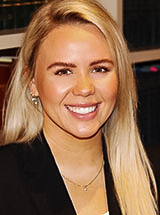 from Arizona State University’s Sandra Day O’Connor College of Law in 2017 where she was a Pedrick’s Scholar and a senior article editor for the Sports and Entertainment Law Journal. She also holds a Master’s in Sports Management and Leadership from Northeastern University and a Bachelor of Arts from Michigan State University. While at Michigan State, Ms. Purtzer was a four-year varsity athlete on the softball team. Ms. Purtzer is active in the local community through coaching softball and mentoring young athletes. When she is not working, she enjoys traveling, reading, cheering on the Spartans, spending time with her dog, Paisley, and supporting the local art community.